Zachary Warren, of Mountain Home, will be traveling to Queensland, Australia, to compete in the 31st Down Under Sports event as part of the Idaho Cross Country Team. Warren is a member of the MHHS Cross Country Team. 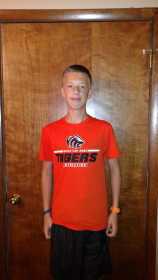 Zachary Warren began competing in the sports of cross country and track and field during his sixth grade year at Hacker Middle School and has worked hard training as a runner ever since. Now as a sophomore at MHHS Warren spends his time focusing on athletics and academics and is a member of the speech and debate teams and was part of the Mock Trial team from the high school that just finished in third place at the state competition. After finishing high school he plans to continue his studies with the goal of becoming a lawyer. He hopes to continue to compete in both debate and cross country at the collegiate level if possible. In addition to running for the high school in cross country Warren has also completed some half marathons including the Zietgerist and Fit For Life. This cross country season Warren received a letter inviting him to compete at this year's Down Under Sports event in Queensland Australia and he eagerly accepted. The Down Under Sports programs use the common language of sports to bridge the continents and provide a forum for athletes from around the globe to compete head-to-head in the sport they love. Warren will leave for Australia on June 29th and will return home on July 8. While there he will compete in two races: an All American race, in which, he will represent Idaho and an international race as a representative of the U.S.A.For the full story, pick up a copy of the Mountain Home News or click on this link to subscribe to the newspaper's online edition.